Gov. Bill Walker and Republican gubernatorial candidate Mike Dunleavy. Alaska Independent Gov. Bill Walker would beat Republican challenger Mike Dunleavy by nearly eight percentage points if a head-to-head election, according to survey results obtained by The Midnight Sun. The poll, which was conducted by Anchorage pollster Ivan Moore’s Alaska Survey Research firm, surveyed 761 Alaska adults with a ± 3.6 percent margin of error. The polling was conducted between March 25 and March 29. It showed Walker would tally 51.4 percent of the vote to Dunleavy’s 43.6 percent of the vote. Just 5 percent of voters were undecided according to the polling. The polling takes a narrow look at the race, assuming a head-to-head between Gov. Bill Walker and Republican front-runner Mike Dunleavy, who has yet to lock up the Republican nomination. The race for governor has yet to see a major Democratic entrant, but thanks to a recent Alaska Supreme Court ruling Walker could enter into the Alaska Democratic Party’s primary. Alaska’s primary election is Aug. 21, and the general election will be on Nov. 6. The survey asked respondents their favorability rating of the candidates as well as their vote if the election were held on the day they were asked. Walker has a positive net approval rating with 44 percent of respondents saying they had a very or somewhat positive opinion on Walker while 34.9 percent said they had a very or somewhat very negative opinion. Just 4.4 percent didn’t know who Walker was and 16.6 percent of respondents had a neutral opinion. Meanwhile, about a third (33.2 percent) of voters didn’t know who Dunleavy was. The voters who did, however, had a wider net approval rating of Dunleavy than Walker. Dunleavy’s combined positives clocked in at nearly 29.7 percent to a combined negative of 14.5 percent. 22.5 percent of respondents were neutral toward Dunleavy. 13 Comments on "Gov. Walker leads GOP front-runner Dunleavy 51-44 in head-to-head poll"
What the poll doesn’t tell us is Dunleavy’s backers are much less likely to vote. They’re a bunch of whiners who will be home on the couch watching HBO and drinking Bud Light on election day. Count me as one supportive of Governor Walker and as one with a “very negative” opinion about Dunleavy’s ability to govern. 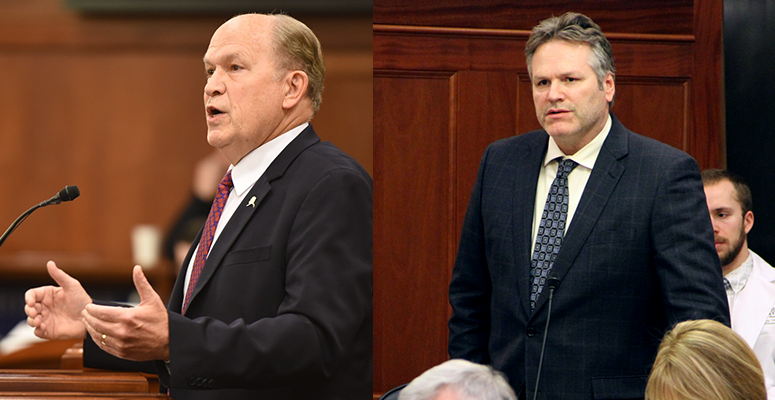 Though I don’t agree with all of Walker’s positions and actions, he stands head and shoulders above Dunleavy who lacks substance, quit office, frittered away state funds on capital projects destined to fail while chairing the Senate Finance Committee, and accomplished nothing before justly acquiring the nickname “The Quitter”. Good. Dunleavy has no substance and is primarily backed by his brother who has some ethical issues. As far as I can see, Walker is the only adult in our government. This poll comes from liberal loudmouth Ivan Moore’s Alaska Survey Research, the worst-rated pollster in Alaska (with a “C” rating) according to 538. Polling in Alaska is difficult, and it’s early in the race. No doubt the race for Governor will be vicious, but these numbers mean very little. Who’s voting?I never heard of got mail saying the public can vote. Dunleavy or Bust! Walker is a liar and is living in the clouds with his pipe dreams. The Alaska Gasline Development Corporation (AGDC) announced the selection of Keith M. Meyer as its new president making $550,000 a year!?!?!? That’s more than a USA President, its time to cut all the fat off this state and it starts with Walker. “Dunleavy or Bust!” That’s laughable. If Dunleavy becomes our governor Alaska will be “bust”. I suggest you compare the numbers of Dunleavy’s work while chairing the Senate Finance Committee (before he quit) to Walker’s numbers since becoming governor. Dunleavy successfully pushed for spending hundreds of millions of dollars on capital projects that would never succeed. Since Walker’s arrival the state budget has dropped by a billion dollars. Yes, I agree that Keith Meyer is overpaid. However, Meyer’s salary doesn’t magically make Dunleavy “The Quitter” substantive nor competent. He is the least able of the three Republican governor wannabes. Why isn’t there anyone else running for Governor? Don’t we have more than a couple of people willing and able to lead our state without taking away from the citizens? All for Walker are enabling him to keep on spending what we do not have. Doesn’t Alaska have more than a couple people willing and able to lead our state without running it into the ground? Most Alaskans hate Bill Walker and that’s a well known fact.